Citrine is a transparent, yellow variety of Quartz, ranging in color from pale to golden yellow, honey or almost brown, and may contain rainbow or sparkle inclusions. Much of the commercial Citrine on the market is heat-treated Amethyst or Smoky Quartz that produces an enhanced Citrine color, usually a deeper amber or orange-reddish shade. Most Natural Citrine is a pale yellow color. Called The Merchant's Stone for its properties of increase in the cash-box, sparkling yellow Citrine not only assists in acquiring wealth, but helps in maintaining it. It is a stone of abundance and manifestation, attracting wealth and prosperity, success and all things good. It also encourages generosity and sharing good fortune. Citrine assists in all fast money ventures, and is especially helpful in financial speculation and for commercial success. Carry one in the purse or wallet to attract money and stop excessive outflow. 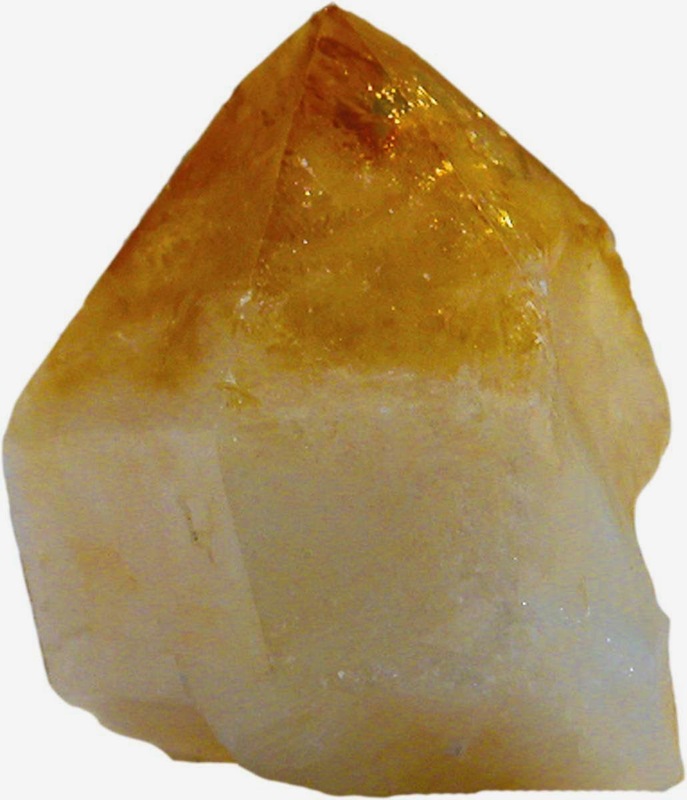 Citrine is an excellent crystal for interpersonal relationships. It smooth family or group problems, and promotes solutions and cohesiveness. It also helps in understanding and dealing with absorbed impressions from those around us. Natural Citrine tumble stones, placed where light catches them, clears unfriendly ghosts from an area. Sprinkle a Citrine elixir weekly to prevent the negative energies from returning. A small warning: Citrine may exacerbate aggressiveness in some. It is not recommended for those with a fiery, quick-tempered nature, and should be avoided by people with a tendency to slander or gossip. Place in the wealth corner of your home or business, or in the cash box. Citrine fades in sunlight. Natural Citrine enhances physical stamina and energy, supports the endocrine system, and encourages proper metabolism. It is beneficial for Chronic Fatigue Syndrome and may aid in reversing degenerative disease. It is thought to balance the thyroid and facilitate the diminishment of growths. Citrine stimulates digestion, the spleen and pancreas. It helps keep skin, nails, and hair healthy, and is good for relieving skin irritations and allergies, especially those caused by food or chemical intolerance. Natural Citrine is beneficial in eliminating infections of the kidney and bladder, and in the treatment of bed wetting, particularly in young adults. As an elixir, Citrine relieves menstrual and menopausal symptoms, such as hot flashes, hormone imbalance and the alleviation of fatigue. It may also be used for nausea and vomiting, and morning sickness. Citrine activates nerve impulses, strengthening intelligence and the intellectual faculties of concentration and wisdom. Citrine opens the higher mind to accept joy in one's life, releasing anger and negative feelings, deep-seated fears and destructive tendencies. An excellent crystal for overcoming depression, Citrine reduces the sensitivity to criticism and inspires creativity and self-expression. It raises self-esteem, and by letting go of the past, allows one to move forward optimistically, enjoying new experiences and explorations. Natural Citrine is a powerful purifier of one's will center, helping to identify and heal issues of power abuse and feelings of helplessness. It enables one to understand what is necessary to resolve those situations, and provides the courage and fortitude needed to make difficult decisions and take action. Natural Citrine's radiant yellow and gold energy activates, opens, and energizes the Solar Plexus and Navel Chakras, directing personal power, creativity, and intelligent decisiveness to enhance the physical body. Its foremost energy is to aid in manifestation. When one is totally attuned to the creative Life Force, simply clarifying, defining and projecting what is wanted will draw those purposes toward the person like a powerful magnet. It is very important to use this power of attraction only for the highest good. Otherwise what is drawn will become attachments that will eventually bring loss and sorrow to the possessor. The gold ray produced in high quality Citrine, especially in faceted form, also stimulates the Crown Chakra, and can be used to channel pure Crown energy back to the Solar Plexus and Navel, allowing for synthesis between the intellect and the body's total perfection. It increases clarity of thought, mental focus, and protects and directs the use of the creative Life Force in one's life. The Solar Plexus Chakra is the energy distribution center and the chakra of relationships. This chakra is located between the rib cage and navel, and controls the immune and digestive systems. When in balance, you have strength to fight infections, are free of allergic reactions, and are able to use the nutrients you ingest. It also allows you the freedom to interpret the world through your own thoughts and emotions and not live in fear of violating the dictums of others. The Navel, or Sacral Chakra, is located below the naval and above the pubic bone at the front of the pelvis. It controls the flow of energy and is the center of gravity of the body. It is the center of the Life Force, and controls the flow of information from the body to the mind and from the mind to the body. Gut feelings, intuition, and other "non-linear" communication comes from this chakra. When it is in balance you have grace, feel pleasure in life, find you are flexible and can "go with the flow" and do so in good spirit. Natural Citrine is an excellent crystal for those who are overly sensitive and extremely vulnerable to outside energies and influences. Worn, carried, or used in crystal healing, the radiant yellow color will increase the amount of light surrounding the body and protect the aura. It is also a good talisman to have in situations where one needs to feel confident and secure. High quality Citrine reflects the golden ray so clearly it beams positive sunlight energy directly into one's environment. In single generator form, Citrine crystals can be set in gold and worn with the termination point facing downward, channeling the crown energy into the body. 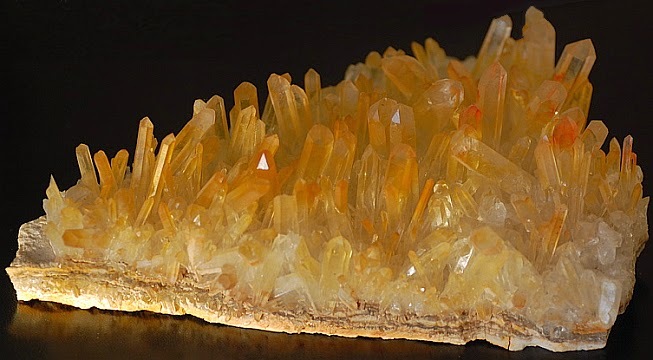 Citrine Cathedral Quartz is particularly useful to those who have experienced emotional or physical lack, especially ingrained poverty consciousness over several lives. The crystal returns to the problem's core and corrects the underlying belief, replacing it with a positive outlook, and allowing for spiritual and physical abundance to carry forward. Yellow crystals ensure that new relationships get off to a good start by aiding in the establishment of good communication. They help you focus on the needs of the person or group you are getting to know. Dark Yellow Citrine is an excellent aid when decisiveness, precision, or persuasiveness is needed. Gold Citrine brings success, enthusiasm, happiness, and power. It is traditionally the color of kings, riches, and the sun. Gold touches a deep part of our minds, conjuring up images of mystical places and adventure. Light Gold crystals provide us with the simple pleasures of life - cheerfulness and contentment. Dark Gold crystals have a deeper, more pronounced sense of devotion and commitment, providing us with a mature enthusiasm and ability to share a lifelong commitment of care and love. Citrine is useful in meditation to open the doors to inner thought. It allows the flow of the Universal Life Force and promotes an easy transition into the meditative state. It activates the thinking processes, and brings images forward from the deep mind. When meditating with Citrine, one feels a glowing warmth from within and from without. Its sole purpose is to manifest the golden Light Force onto the physical plane. Please Note: Although Citrine may not need clearing/cleansing as often as most crystals, we suggest clearing your Citrine as often as is needed, based on (1) the amount of use it gets (how hard is your crystal working for you?) and (2) the amount of energy that your crystal has been exposed to over a period of time. When clearing your crystals, always make sure that your intent is clearly stated, so the crystal knows that it is being given some time off and needs to recharge itself. As I love the crystal and so I keep wonderful collection of crystal related books. I always keep reading and surfing on net also, so I have gather many information and also done practical experience about the crystal energy. I have enjoyed the benefit of crystal healing, but any information on uses and properties included with this listing (which has been gathered from reputable sources, such as Judy Hall and Michael Gienger's books on crystal healing) do not, under any circumstances, constitute a claim on behalf of the Seller. The information given is not intended to act as a substitute for medical treatment, nor will any guarantees be given for any spiritual or metaphysical qualities.